Hanover Township has an immediate need for an Emergency Management Coordinator. The job description can be found below. Interested candidates should forward any questions, or their letter of interest and resume to the Township Manager (cgarges@hanleco.org). The Township will be accepting applications through May 4, 2019. Hanover Township is an equal opportunity employer. For more information on the Spotted Lanternfly, go to General Info. up top and click into FAQs on the left and scroll to the bottom on page. Hanover Township's annual street sweeping program will begin on Monday April 1. Please be reminded that vehicles which are parked in violation of the sweeping schedule will be ticketed and risk being towed. The schedule can be found below. Hanover Township is seeking a part time seasonal employee in our Public Works Department. The focus of the position will be maintenance of Township Parks. The position requires availability on weekend mornings (0800-1000) from April through October. A valid driver’s license is required. Interested persons should contact Jeff Mouer at jmouer@hanleco.org or 610-264-1069. On Wednesday, April 17 2019 at 7:30 PM, Hanover Township Council voted to adopt Ordinance 613 (Ayes: Lawlor, Woolley, Paulus; Nays: None Ordinance 613 is An Ordinance Amending Chapter 20, Part 4, Section 403 Of The Statutory Code Of Hanover Township To Establish A Date For Mailing Bills For Solid Waste Collection And Recycling Fees And To Allow Waiver Of Collection Of Such Fees In Any Year By Resolution Of Council. A copy of this Ordinance is on file with the Township Clerk (Township Building) and may be inspected by the public during normal business hours. On Wednesday, April 17 2019 at 7:30 PM, Hanover Township Council voted to adopt Ordinance 612 (Ayes: Lawlor, Woolley, Paulus; Nays: None Ordinance 612 is An Ordinance Amending The Zoning Map Of Hanover Township Changing The Classification Of Certain Land East And West Of Willowbrook Road From Planned Commercial (PC) Or Planned Residential (PR) To Planned Industrial Office (PIO). A copy of this Ordinance is on file with the Township Clerk (Township Building) and may be inspected by the public during normal business hours. On Wednesday, April 3, 2019 at 7:30 PM, Hanover Township Council voted to adopt Ordinance 611 (Ayes: Heimbecker, Lawlor, Tocci, Woolley, Paulus; Nays: None Ordinance 611 is An Ordinance Amending Chapter 1, Part 7 Of The Statutory Code Of Hanover Township To Provide A Job Classification For An Emergency Management Coordinator And A Part Time Receptionist. A copy of this Ordinance is on file with the Township Clerk (Township Building) and may be inspected by the public during normal business hours. On Wednesday, April 3, 2019, at 7:30 PM, Hanover Township introduced Bill No. 2019-04, An Ordinance Amending Chapter 20, Part 4, Section 403 Of The Statutory Code Of Hanover Township To Establish A Date For Mailing Bills For Solid Waste Collection And Recycling Fees And To Allow Waiver Of Collection Of Such Fees In Any Year By Resolution Of Council. The Public Hearing on said Bill 2019-04 will be held on Wednesday, April 17, 2019, at 7:30 PM in the Township Building, 2202 Grove Road, Allentown, PA 18109. Copies of this proposed Ordinance are on file with the Township Clerk (Township Building) and may be inspected by the public during normal business hours. On Wednesday, April 3, 2019, at 7:30 PM, Hanover Township introduced Bill No. 2019-03, An Ordinance Amending Chapter 18, Part 2 Of The Statutory Code Of Hanover Township To Provide For A Reduced Sewer Allocation Reservation Fee, Collection of Accrued Capital Costs As A Tapping Fee Upon Issuance Of A Sewer Permit And Providing For Transfer Of Sewage Treatment Capacity From Hanover Township To Other Municipalities. The Public Hearing on said Bill 2019-03 will be held on Wednesday, April 17, 2019, at 7:30 PM in the Township Building, 2202 Grove Road, Allentown, PA 18109. Copies of this proposed Ordinance are on file with the Township Clerk (Township Building) and may be inspected by the public during normal business hours. On Wednesday, March 20, 2019, at 7:30 PM, Hanover Township introduced Bill No. 2019-02, An Ordinance Amending Chapter 1, Part 7 Of The Statutory Code Of Hanover Township To Provide A Job Classification For An Emergency Management Coordinator And A Part Time Receptionist. The Public Hearing on said Bill 2019-02 will be held on Wednesday, April 3, 2019, at 7:30 PM in the Township Building, 2202 Grove Road, Allentown, PA 18109. Copies of this proposed Ordinance are on file with the Township Clerk (Township Building) and may be inspected by the public during normal business hours. 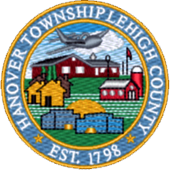 On Wednesday, March 6, 2019, 2018 at 7:30 PM, Hanover Township Council voted to adopt Ordinance 610 (Ayes: Heimbecker, Lawlor, Tocci, Woolley, Paulus; Nays: None Ordinance 610 is An Ordinance Amending The Statutory Code Of Hanover Township To Allow Fishing and Ice Fishing In Canal Park. A copy of this Ordinance is on file with the Township Clerk (Township Building) and may be inspected by the public during normal. business hours. On Wednesday, February 6, 2019, at 7:30 PM, Hanover Township introduced Bill No. 2019-01, An Ordinance Amending The Statutory Code Of Hanover Township To Allow Fishing and Ice Fishing In Canal Park	. The Public Hearing on said Bill 2018-16 will be held on Wednesday, February 20, 2019, at 7:30 PM in the Township Building, 2202 Grove Road, Allentown, PA 18109. Copies of this proposed Ordinance are on file with the Township Clerk (Township Building) and may be inspected by the public during normal business hours. Welcome to our new website! The site was designed for easy navigation to the information you are looking for. Please take some time to navigate through our new site. The last day of Leaf Pickup will be Monday, December 5, 2018. For any additional imformation please contact the Township Office. The Township will have a Toys for Tots drop off box in the Reception area of the main building from November 21 through December 10. Toys must be unwrapped and unused. Drop off hours are 8:30 a.m. - 4:00 p.m.
Hanover Township, Lehigh County Public Works Department is seeking hardworking, motivated and multi skilled applicants to fill the position of Equipment Operator/Mechanic "C". Select the links below for more information. Here you will find valuable information about the Township and its services. This website was designed to make it easier and more efficient for residents and other visitors to interact with the Township. We hope you find the site's content to be both interesting and informative. Hanover Township was formed from the southern portion of Allen Township by decree of the Bucks County Court in 1798. Its geographic limits at that time included the present area plus that which comprises Hanover Township, Northampton County, and the area immediately south of the current Township to the Lehigh River. This original territory was retained until 1812 when Lehigh County was established and the Township was divided; approximately two-thirds of its area went to Lehigh County and one-third remained in Northampton County.